Community Service: If students can get involved in giving back to a cause or helping their community in a way that matters to them, the lasting benefits can be far-reaching. As anyone who has ever volunteered knows, the satisfaction and pride that comes from helping others can be life changing. At ‘Learning Paths School’ community service is an essential part of the curriculum and and the club is aptly called – Advantage India. Two lessons a week are devoted for activities of Advantage Club. 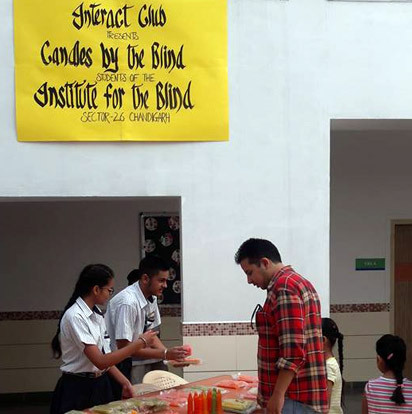 Students are encouraged to think beyond themselves and help those in need.The club elects its own prefects, carries on fundraising activities, and organizes innumerable events to help the community. October, every year, is celebrated as the ‘Joy of giving month’ or ‘Daan Utsav’ wherein all the collections made over the year by way of cash and items are given to various individuals and organizations in need of the same. The students of the school are also involved in activities of ‘Teri’, carrying to the public the message of ‘save and protect your environment’. 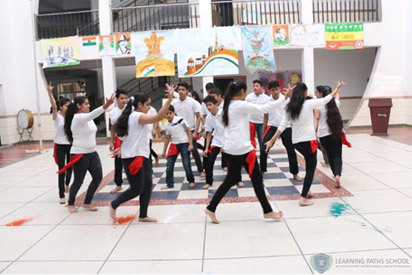 At the ‘Rahagiri’ venue in Chandigarh, to support ‘Swach Bharat’ and ‘Save and Help the Environment’, students presented a mime show to show the repercussions of water shortage; a quiz competition was conducted on questions on environment—all those who answered correctly, got a board game as a prize, made by Priyanshu (Class X), for which she got an award from Teri at the national level. Bags made of recycled clothes were distributed among all those present.Different labelled dustbins were put up at the venue to teach the public how to separate garbage according to its ultimate destination. Advantage India recently started its venture called Paper Bank which runs on the concept of using unused paper from the old semi-used notebooks. The organization makes new notebooks from this unused paper. The venture was started with the aim of teaching entrepreneurial skills and economic values to the students. Moreover, it aims to raise awareness about the importance of re-using and recycling paper among the students of the school and other schools.